A trailer of the film Comeback of the lynxes or what happened from 13th June until the end of November 2008. Since 01.07.1991 Miloš Majda is a ranger in Malá Fatra Mts. National Park. In 1999, he tried a very interesting experiment in close cooperation with ZOO Bojnice. Actually, it was a timeless project and the main aim of it was to find if it is possible to take back lynxes born in ZOO to the wild nature in some way. In that time we knew for sure that the age in which the ZOOs have to vitalize the gene pool of isolated populations and to increase the number of disappearing species in wild nature will come. He took a lynx cub from the ZOO and he tried to nurse and released the cub back to the wild. He got over initial problems successfully when the cub, separated from its mother, denied feeding and so it fell sick. But soon, the small lynx became a really vital villain. Its first catch was a hamster reared by Miloš´ son Miňo. After three months, Miloš started to get the lynx Miki accustomed to the place of planned release. They chose a beautiful wilderness in Bystrička valley in the Malá Fatra Mts. National park. They guided the lynx through distant animal paths. Mikino grew together with new environment immediately. The field station of the Administration of the National Park was their occasional recourse. In the attic, the lynx started to catch its first mice and dormice. It became a rule that the animal goes alone to the nature for a few days and nobody knows about his movements till snow fall. We were afraid about Miki so we put a terrestrial transmitter on his neck to prevent he would get lost during the first weeks, Miloš remembers. Only according to injuries on his fur, probably due to a wild lynx female, they found what Miki experienced. Once he came a little bit vigourless. I enter the car to take some material and Miki followed me. When I opened the car he jumped into and lay down to the rear seat. I was surprised because usually he does not want to go into the car. Probably he was bitten by a viper when he tried to catch it. He lay in the kitchen under the table for three days and did not eat. Afterwards, we come back to the valley where he is fully interested in his the most favourable activity – observing the animals. One and a half year elapsed. On 31.08.2000 Miki comes back to the cottage for the last time. He answers from slopes to Miloš, who still leaves meat for him in one place in the forest. Miloš knows that the lynx is still around the cottage only thanks to the tracks around the feeding place and occasionally eaten meat. He did not take always food from us. It meant that he fed by himself and he was in a perfect physical condition. Later, the track in the snow showed us that the lynx is still in the valley and sometimes he passes around the cottage. One and a half year ago on 26.02.2002 Miloš met Miki on a side ridge where he liked to go. It was during the mating season of lynxes and Miki was there with a wild lynx female (see diary Miki). Since that moment Miloš met him again just a few times. But Miloš will have this meeting in his mind for a long time. The difficult aim was successfully done. Miki was successfully implanted into the wilderness of the Malá Fatra Mts. National Park and he surely enriched the lynx population by its genes. On the basis of the mentioned history, many people ask the ranger Miloš Majda for help. They know that Miloš knows nature and animals living there very well. In this moment, our film about Miloš and two young lynxes should begin. During one and a half or two years the film camera should watch Miloš with his faithful followers – lynx siblings. From the real beginning when the employees of the ZOO Ostrava invited Miloš and her wife Erika to two three months old lynx cubs, through feeding cubs with syringes containing a wonderful milk elixir, or feeding with scratchy chicken meat, through abdomen massage because of defecation, through many problems with cubs inclined to diseases, we will get to the mountain cottage to the wilderness. At this moment Miloš with his wife Erika will move to the cottage and their main aim will be nurture the lynxes. Before the releasing of the lynxes to the wild nature, Miloš has to become their mother, he has to learn cubs to hunt. Also wild lynxes living in the surrounding help him. The cubs will learn to feed on animals caught by wild lynxes. During the winter, roe as well as deer young will be their prey. Of course, he has to learn lynxes to hunt also living prey for which he will use quails, rats, mice, and rabbits. The lynx cubs will improve their hunting skills also with catching mice or dormice living naturally in the cottage or in the forest. As the animals will be older and older they will occur in the cottage rarer and rarer. Cubs are released and exposed to the possible dangers in the forest. They will venture alone to the vicinity for field investigation; they will track and meet every wild animal living in the surroundings. They will learn what does it mean to have their own home range and which type of prey they should hunt. It is very probable that a wild lynx female living in the surrounding will learn them a lesson for several times and it will be a really big education for our lynxes. They will learn to pay attention to vipers which can bite them but also to fire salamanders – although they look nice they are not suitable for eating. If they will not be successful in catching prey they will find it in a stable place behind the cottage. Later, a progressive weaning away people will begin. We will film how the still growing lynx cubs will learn to avoid other people but they are not afraid of Miloš and the cameraman. Together with lynxes we will experience several days’ long trips in daylight as well as nightlight forest. For several days the lynxes will follow Miloš but sometimes they will break away and finally they will find Miloš again. In the forest, the lynxes will show to their adoptive father many things invisible for men under normal circumstances such as resting places and dens of wild lynxes. Together with our lynxes we will track wild lynxes in the snow. 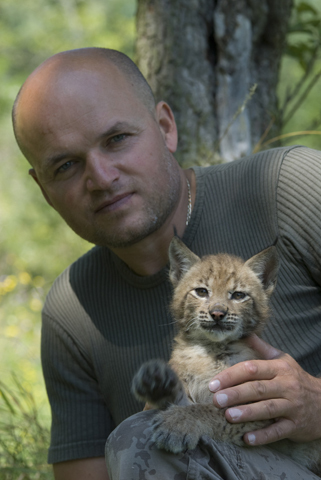 According to Miloš´ experiences with previous nursing of the lynx cub, during trips in the nature of the Malá Fatra Mts. National Park, it often happened that the shyness of wild carnivores such as lynx, bear, wolf against people decreased. Wild animals observing movement of man with lynx for a long time loose their shyness and the escape distance shortens. Because of a lot of time spent in the wild nature, meetings with other wild animals will be common. One year will past and the lynx siblings will start to be independent increasingly, the contact with them will be rarer and rarer and the lynxes will go to the wild nature where they will live their own life. They will find their territories and it should be a happy-end of this film project: lynx cubs from ZOO come to the people’s hands who try to put them into their home, to the wilderness. The main story of this document is, of course, nursing and relation between Miloš and lynx siblings in the nature of the Veľká Fatra Mts. National Park. We would like to present also the work of the ranger in the national park. Miloš is specialized in birds of prey, owls and large carnivores. We will have a possibility to observe the monitoring and management of golden eagles, lesser spotted eagles, peregrine falcons, and owls. Nest controls on stones and trees. Stabilization of nests on trees, cleaning of stone cavities from self-seeded trees, installation of the camera as a prevention before poachers. We will be witnesses of adoption of younger golden eagles in the nature. In the case that the poachers will rob the nest, such taken young will serve as back-up eagle for repeated replacement to the nest. Cainism is incorporated in the genes of the eagles. Older young displaces or kills the younger one. For stable abundance of critically endangered golden eagles, the younger one is taken away and it will come back to the same or other suitable nest. Together with lynx cubs, we will track large carnivores (lynx, wolf, bear as well as otter) and we will observe their ethology during mating season and during the whole year as well, their feeding habits and dangers which occur in the nature and dangers which we – people, prepared for them. Through this film, we would like to show you the comeback to the values, respect to the nature and to patterns which function in the nature, and which we have to take into account more and more and to leave them a space. The scientific part of this project consists in monitoring of our lynxes´ movement via satellite telemetry. We decided for it to prevent many presumptions and to obtain exact data about the movement of animals during one or two years at least. After obtaining such information, the lynxes simply lose their collars. The technical structure of the collar allows it – for sure, this function is multiplied in the collar. After loosing the collar, we will find it in the field because we will know where it is. For its identification the collar emits signals. Another aim of the project is to catch two wild lynxes (male and female) which occur in the same area. Also trapped wild lynxes will be collared with satellite telemetry. Such obtained data will confirm their frequency of movement in their territories during particular seasons, the extent of the home ranges of the male and female. Such data are unknown. To achieve these aims we started to cooperate with colleagues from Czech Republic and Slovenia whose are well-experienced with satellite telemetry and trapping of wild lynxes since 1996. Another activity of this project is collecting of scats of the wild lynxes and the following DNA analyses. Besides obtaining DNA we can also monitor space dynamics of particular individuals from repeating samples. Another role of the people moving in the field is to monitor abundance and movement of other large carnivores such as bears, wolves, collecting of fresh samples of the scats for DNA analyses.